September 2018: CoreLogic Home Price Index with home price forecast for September 2019; prices increased, again, but will be slower to rise during the next year. Looking ahead, the CoreLogic HPI Forecast indicates home prices will increase by 4.7% on a year-over-year basis from September 2018 to September 2019. On a month-over-month basis, home prices are expected to decrease by 0.6% from September to October 2018. 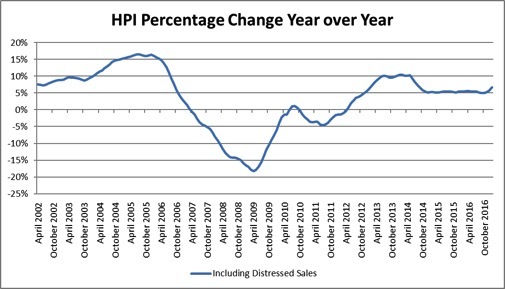 The CoreLogic HPI Forecast is a projection of home prices calculated using the CoreLogic HPI and other economic variables. Values are derived from state-level forecasts by weighting indices according to the number of owner-occupied households for each state. According to the CoreLogic Market Condition Indicators (MCI), an analysis of housing values in the country’s 100 largest metropolitan areas based on housing stock, 38% of metropolitan areas have an overvalued housing market as of September 2018. The MCI analysis categorizes home prices in individual markets as undervalued, at value or overvalued, by comparing home prices to their long-run, sustainable levels, which are supported by local market fundamentals (such as disposable income). Additionally, as of September 2018, 19% of the top 100 metropolitan areas were undervalued, and 43% were at value. When looking at only the top 50 markets based on housing stock, 46% were overvalued, 14% were undervalued, and 40% were at value. The MCI analysis defines an overvalued housing market as one in which home prices are at least 10% above the long-term, sustainable level. An undervalued housing market is one in which home prices are at least 10% below the sustainable level. In 2018, CoreLogic together with RTi Research of Norwalk, Connecticut, conducted an extensive consumer housing sentiment study, combining consumer and property insights. The study assessed attitudes toward homeownership and the drivers of the home buying or renting decision process. When asked about the desire to own a home, potential buyers in the younger millennial demographic have the desire to buy, 40% are extremely or very interested in homeownership. In fact, 64% say they regularly monitor home values in their local market. However, while 80% of younger millennials plan to move in the next four or five years, 73% cite affordability as a barrier to homeownership (far higher than any other age cohort).